As you travel by train from London or Bristol to South Wales, your train passes through Patchway station ... through tunnels under the Aztec West Business Park where some 7,000 people work, and across open farmland past villages of Easter Compton and Pilning, with industrial and business development just to the south at Westgate being the northern fringe of the Severnside Enterprise Zone. The train then dips and plunges into the tunnel under the River Severn. It's unlikely that your train will stop at Patchway - just one per hour does so of the fours that pass through, it certainly won't call at Aztec West as there's no station there, and since late 2016 it can't call at Pilning because the platform was left isolated by the removal of the footbridge, which has not been replaced. 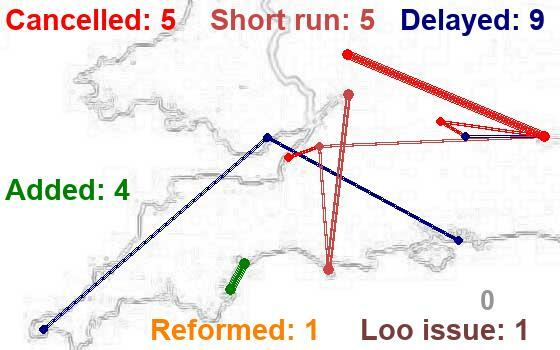 So your train has passed through the last 8km of England where there are many journeys starting and terminating - and many more to be added in future years - without any way that the rail network can be used for those journeys. What should be done in the future? Is the correct use of the railway for this area for it to convey passengers from one side through to the other without giving them the opportunity to join and leave trains - without giving residents and employees the chance of train travel, without giving businesses and developers the opportunities of progresssing the economy of the (greater) area by improving its connectivity. There is, still, a station at Pilning. But it's impractical for most people to use. Passenger trains only call in one direction, and they only call on Saturdays, and then only 2 times. The station isn't close to where people live int the village not to employment areas, it's on a minor road, and it's not attractive. But it's all that the area has, and quite a number of keen people make a point of visiting it and using it with the intent of keeping it on the agenda, and looking to where it might go and grow in the future. The current setup appears perverse - an oddity - and the question is raised "how could we improve this for the mutual benefit of all parties" and when we have some answers to that "how do we actually achieve that benefit in real life, and not just in theory"
Our Documdrama piece was intended to grab attention. To "alight fires of interest" if you will. Our group ("SEWWEB") garnered some interest early on, but over the last ten days that flame has really been alight. 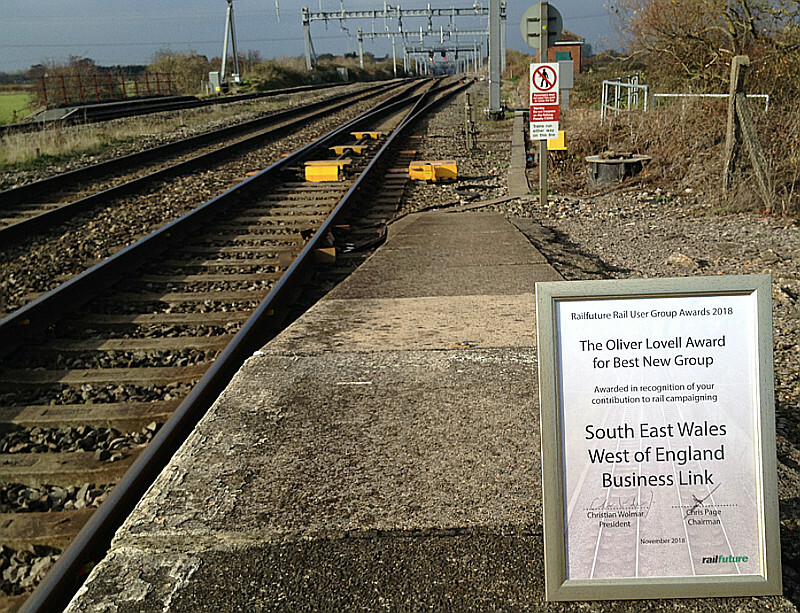 The group was entered into the RailFuture awards, where it won the Oliver Lovell Award for best new group. Being recognised by a considerable group of forward looking industry experts, presenation by the retired MD of a major train operator, presided over by a well respected transport specialist author / journalist for sure puts us onto the radar. And it re-ignites the interest and questions from many, many others too who have taken a look at the area in question, the transport in and around, to and from it. Not all the answers yet, but elephants in the room pretty well identified. I am marking a date in the new year as a diary entry for this thread - by that point we can look forward at the initial analysis of options with much more clarity. So - where are "we" now. A lot of interest. A lot of questions. A number of concerns. A lot of ideas. But as yet No "we are going to do this" or "we plan to do that" - the options need to be looked at and explored, compared, tuned or even turned upside down to come up with the best plans. And done openly and shared in a friendly way so that as the analysis concludes, a team - and that's a team with so many more people involved and all rowing in the same direction that the group that lit the fire. Get the analysis done, get the team together, and the way forward is for the mutual benefit of virtually everyone. Fail to coagulate, fail to come to an understanding and the current oddity will continue providing minimal effective transport, until the next someone says "this should not go on". Let's grab the nettle and help decide for ourselves - for the community and the economy - what's needed and wanted, and not leave it to someone else, by default, at some later date. I can see four major options around the Pilning area ... I can see three options around Aztec West. Each has varients, long term possibilities though they will be very different. Each will have its own business case which will show some as impractical unless implemented as a political expedient, or as a real motor for the area's future. For the absence of doubt, the current options at Pilning are for the station to remain "as is", for it to remain in its current location but with train able to call in both directions, for it to move to the B4055 bridge on the outskirts of Pilning Village, and for it to move to where the A403 crosses the railway which is in a very short tunnel at that point. Each of those options has multiple additional sub-options relating to "how would we do it", "exactly what would we do there" and so on. Team plan. To gather together the options and overview data for them. To do some initial comparative analysis. To set up a handful of presentations, exhibits, and discussions and visits and to listen and extend or be involved in the setup of a newer and wider partneship with common goals. At this point, I cannot give definitive answers to all the questions that are flying around. The person who has had an availability and potential interest for ten years, and who testily demands answers from the SEWWEB team just ten days after we come onto the radar, needs to supply us with data and be patient while we work stages (1) and (2) of the strategy - generating interest, and analysing options, putting them into something of a common form and context, and looking at where we go. The person who has a tremendous foresight beyond the rest of us, but sees the area purely in maps and figures and possibilities and speculates as a "crayonist", needs to visit - see it in real life, fill gaps in his local knowledge and learn about local emotions and visions. The person who's a rail enthusiast and lover of the current and history needs to take the brave step, widen and say "what would work for the future; I will listen and suggest"
The person who lives locally needs to listen and inform - to make sure that everyone interested in this firestorm over the last few weeks is informed, and that any outcomes really work for them and for the area - perhaps that the area moves forward rather than risk sinking into something that's unpalatable - or (if I am cyncal) even less palatable than agreed and commonly supported steps forward. But I can tell you that we will have far more informed and more detailed answers in the New Year and are looking to share them and learn further. We are talking about physical schemes ... but we are looking at how plans will effect people's lives. I am - personally - happy to help with a few days of time; I have to look after my own business and direction, but love to be an enabler. There is a question on the analysis "ooz gonna pay for this" and that question magnifies if the net outcome is a development project. We are somewhat further ahead on that than you may think; I can already quote guestimates of cost-per-journey of defraying capital costs oer 30 years - and depending on the options and optimisms, they range from under 50p to over £20. It was very interest to hear Ian Baxter of SLC rail affirm talk about project funding and ideas at RailFuture just 10 days ago and, yes, it could be done under the way governance and funding is headed. I worked at Aztec West for a few years in the early 00's and the only form of transport that seemed to make any sense was the bicycle: Buses took impossibly long, convoluted routes, it was too far to walk, and while the controlling assumption is that 'everyone drives' this in practice didn't work very well either. Despite huge car parks there weren't enough spaces (where do you go if you can't park? Almondsbury? ), and despite high-capacity signal-controlled junctions the congestion was really bad. This is exciting stuff, grahame! Any solution for Aztec West has to include a rail station, and possibly YoBikes or a local frequent bus. Many months ago I believe Grahame postulated moving Patchway station the half mile to the bottom of Aztec West and Patchway. A much better location, nearer to homes and employment, the only negatives where the steep sides of the rail embankment at this point. If this could addressed, and all Bristol TM <-> Cardiff trains where to stop there, then it would certainly make Public Transport more viable. 4. Bore a subway east of the station under the up loop. up main and down main and then a bored ramp to the surface and thence continue up the existing platform ramps giving step free access to all 4 platforms of a Pheonix Pilning arising out of the ashes of the current blot on the landscape. I don't consider disadvantages when I make plans/suggestions, I only look on the positive sides of things because otherwise you'll never get anything done, full stop. 1. 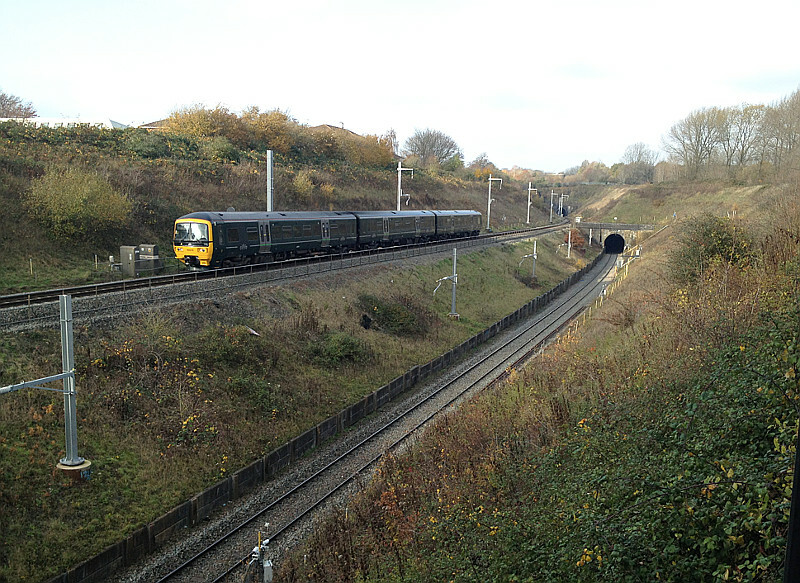 If they can bore a full size railway tunnel under a crowded Central London then modern tunnel boring technology should be able to bore a pedestrian subway under a main railway line in a sparsely populated area of South Gloucestershire. A new station site there might be a bit difficult due to track gradients. I need to do a bit of looking up to see what the latest rules are (unless anybody beats me to it). 1 in 100 iirc. S&T. G 4.2.1 The mandatory requirement for vertical track alignment through station platforms was withdrawn in issue four of GI/RT7016, based on work carried out to support deviations against issue two of GI/RT7016 for specific stations and the findings of RSSB Research Report T815 entitled ‘Limits of vertical track alignment through station platforms’. G 4.2.2 For many years it had been considered good practice in GB to locate platforms on gradients not steeper than 1:260, except where geographic constraints made this unavoidable. This requirement was later changed to refer to a gradient of 1:500, possibly because of a shift from plain bearings to roller bearings across all rolling stock. G 4.2.3 In the circumstances where the Infrastructure TSIs impose limiting gradients through passenger platforms (see G 4.2.11 and G 4.2.12), the limit is 2.5 mm/m - that is, 1:400. G 4.2.4 However, there are many platforms on the GB network that are located on gradients steeper than 1:400 and of those, a significant number are on gradients steeper than 1:100. 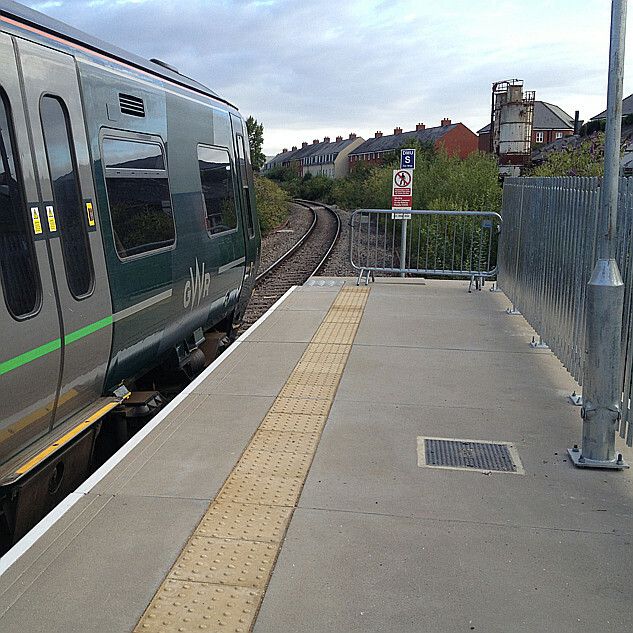 These platforms continue to accommodate a range of train services without having operational constraints on their use imposed because of track gradient. Obviously the guide goes on at greater length than that...and suggests that the TSI limit of 1 in 400 only applies to specially built new, proper HS, lines (i.e. > 250 km/hr). 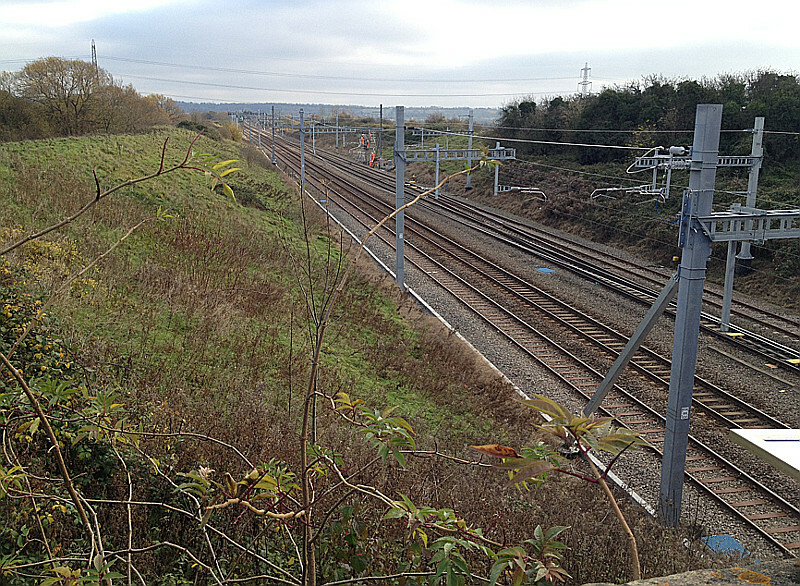 The existing gradient for all three station locations on the Filton Bank is very steep (1 in 76 or 1.33%). Group standard GI/RT/7016 states that: “ Wherever possible, platforms shall be located on track with an average gradient not steeper than 1 in 500. It is permissible for platforms to be located on track with average gradients steeper than 1 in 500 provided trains are not planned to terminate or reverse at the platform” . This is guidance rather than a definitive requirement, but 1:75 is still is considered too steep for a new station to be developed on. Guidance note GI/GN7616 provides further information for consideration of risks associated with proposing platforms relating to horizontal curvature and longitudinal gradients. Vertical track positioning can be adjusted through track lifts and earthworks to re ‐ profile gradients. However, as the provision of a 1:500 platform gradient would lead to excessive gradients on either side of the station, it was decided to target a station gradient of 1:220 (0.45%). This is consistent with a station gradient deviation granted for (the reopened) Corby station (Certificate number 07/182/DGN). Designs using this 1:220 gradient are much more likely to be accepted by Network Rail (NR) even though still requiring some deviation from guidance in the group standards. They do however lead to significant works in terms of Permanent Way and track drainage, signalling, earthworks and electrification. It would be possible to seek deviations from standards for the existing (much steeper) gradient through the station, which would reduce the requirement for Permanent Way works and their associated costs, but this is considered unlikely to be practical that such a deviation would be granted. Costs have therefore only been developed for designs producing a 1:220 gradient through the station sites. It should be considered that failing to achieve a derogation that the 1:220 gradient through a station is acceptable could significantly change the requirements at each station, and thus would require re ‐ assessment of the assumptions in this report. 4.2.1 The mandatory requirement for vertical track alignment through station platforms was G withdrawn in issue four of GI/RT7016, based on work carried out to support deviations against issue two of GI/RT7016 for specific stations and the findings of RSSB Research Report T815 entitled ‘Limits of vertical track alignment through station platforms’. Thanks WP and STUVING. My view is that you would have to make a very good case for 1:100, but in the end doubt you would get it past RSSB. Interesting that the loops (and trap points) are already there at that location, and trains stop there already as a matter of routine (if they didn't, there would be no point in having the loops. Let's leave this as one of many matters to be clarified as we start filling in from the broad brush strokes - GRIPping or JFDIing it onwards. The Ashley Down document I referred to has design details and costings for regrading a ruling 1 in 75 to achieve 1 in 220. There is precedent for 1 in 220; I don't presume anyone is seriously suggesting trying to get approval for anything steeper are they? A friend who's based at the BRI told me about a meeting he had at Aztec last week, or rather the bus journey. As it happens he normally cycles to work (from south Bristol) but decided he wouldn't cycle to the meeting "in order not to arrive as sweaty mess". Bus journey back to the BRI took two hours, which he calculated at an average of 7.5km/h. Perhaps 50% quicker overall than walking... And that wasn't even rush hour, he got back to his office about 4:30. But even if there were an Aztec West station, it's not clear where he might have got the train from. Presumably (the other) BRI, but that requires an additional journey whereas the bus station is just opposite. I work at Aztec West, and walk there from Patchway most days. It's a mile and a half - quite welcome actually before and after a day sitting at a desk. I'm quite sure that relocating the station to the A38 bridge would attract a lot more Aztec West workers to use the train. Getting off the estate by car or bus between 5 and 6 p.m. can sometimes take ages - all it takes is a minor problem on the M5 to jam up the A38 completely. Moving Patchway station wouldn't be popular with workers at Rolls-Royce, of course. My biggest complaint about the train service at Patchway is that, if a train is cancelled, nothing else makes a compensatory stop. I also work at Aztec West and I couldn't agree more. In my case a brisk stroll to and from Redland is a tad ambitious. At least every work day, especially on my later finishing days, is made more exciting by a game of bus lottery.